In other news, there is so much happening right now it's insane. Between getting ready for North Carolina, my birthday is next week (29!!! ), working on two new paintings (Batgirl + No Country for Old Men), it's bananas around the studio. Also!! 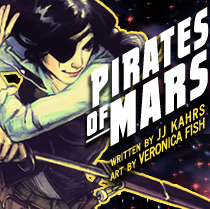 Getting ready to work on Pirates of Mars again as well as more of Frankenstein:1921! Whoa! No sleep, just art and coffee.